Ye Olde Pork Pie Shoppe was built in the early seventeenth centruy and ran as a bakehouse until John Dickinson took it over in 1851. 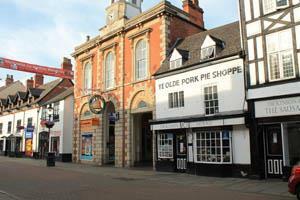 Dickinson & Morris are now the oldest and only surviving pork pie baker in the centre of Melton Mowbray. Mary Dickinson, John Dickinson's grandmother is credited with first making hand-raised pork pies, made popular nationally by hunters wanting a savoury snack. Limited disabled access - no step into the Pie Shop, but once inside there are two small steps. Cash points within 60 seconds walk. Open Monday - Saturday 08.00 - 17.00. Closed Sundays and most Bank Holidays. Follow the A607 to Melton, the shop is situated on Nottingham Street in the centre. Parking for cars and coaches is 40p. There is designated parking for disabled.